Originally recorded in January 1966 by David Sylvester in New York City for broadcast by BBC Third Programme. The interview was later reedited for publication in 1997 for David Sylvester’s “Some Kind of Reality”. David Sylvester: What do you think of as the main sources of your language? 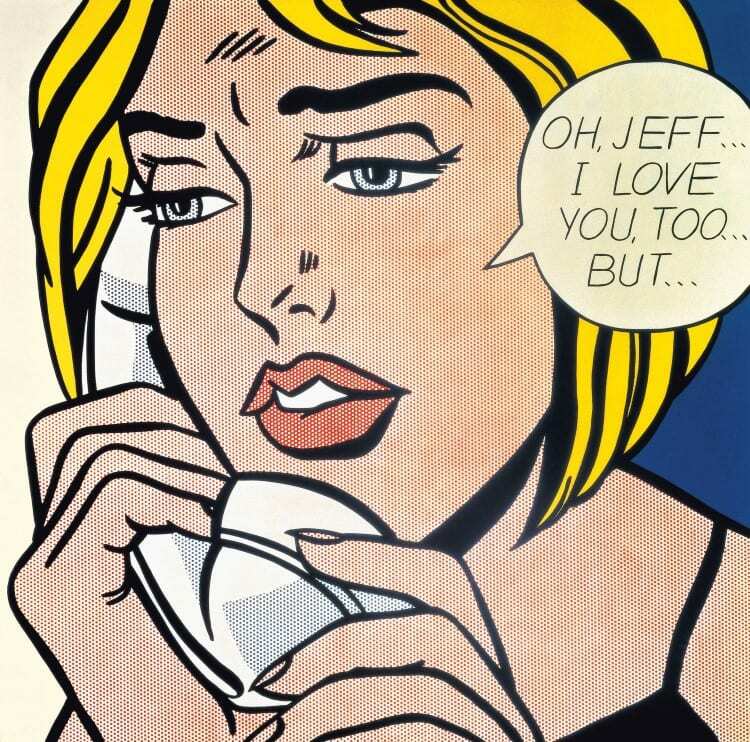 Roy Lichtenstein: Well, I think in some ways, really, Cubism, but of course cartooning itself and commercial art are obviously an influence. But I think the aesthetic influence on me is probably more Cubism than anything. I think even the cartoons themselves are influenced by Cubism, because the hard-edged character which is brought about by the printing creates a kind of cubist look which perhaps wasn’t intended. DS: The kinds of cartoons which you’ve borrowed from, which you’ve parodied, are of a fairly limited kind. You draw on those which are fairly straightforwardly realistic. R L: Not funny cartoons. DS: No. And I take it that this is a deliberate choice. Or is it just an instinctive preference you’ve never thought about? DS: What gave you the idea of doing it? R L: Well this particular one was on a bubble-gum wrapper, and it was a kind of obvious joke. The first ones were very obvious jokes. But I kind of rejected the idea. There’s a tendency to make the cartoons look interesting, and when the original work already looks interesting, or inventive, it takes away I think from – well, maybe this isn’t really a reason, but whatever the reason was, I seem to prefer rather straightforward cartoons. DS: What suddenly gave you the idea of using cartoon images in the first place? R L: I was sort of immersed in Abstract Expressionism – it was a kind of Abstract Expressionism with cartoons within the expressionist image. It’s too hard to picture, I think, and the paintings themselves weren’t very successful. I’ve got rid of most of them, in fact all of them. They encompassed about six months. I did abstract paintings of sort of striped brush strokes and within these in a kind of scribbly way were images of Donald Duck and Mickey Mouse and Bugs Bunny. In doing these paintings I had, of course, the original strip cartoons to look at, and the idea of doing one without apparent alteration just occurred to me. I first discussed it and thought about it for a little bit, and I did one really almost half seriously to get an idea of what it might look like. And as I was painting this painting I kind of got interested in organising it as a painting and brought it to some kind of conclusion as an aesthetic statement, which I hadn’t really intended to do to begin with. And then I really went back to my other way of painting, which was pretty abstract. Or tried to. But I had this cartoon painting in my studio, and it was a little too formidable. I couldn’t keep my eyes off it, and it sort of prevented me from painting any other way, and then I decided this stuff was really serious. I had sort of decided that as I was working on it, but at first the change was a little bit too strong for me. Having been more or less schooled as an Abstract Expressionist, it was quite difficult psychologically to do anything else. DS: All the same, the love of the cartoons took you over quite quickly, if one thinks of your output between the beginning and end of 1961. Was the main attraction the kind of visual language orwas it the kind of imagery? R L: Well, I think that it was the startlinq quality of the visual shorthand and the sense of cliche – the fact that an eye would be drawn a certain way and that one would learn how to draw this eye that way regardiess of the consequences, these ideas being completely antithetical to the ones I felt had to do with art at the time. And I began really to get excited about this. The cliche is a cliche if you don’t know anything else, but, if you can alter this cliche slightly, to make it do something else in the painting, it still seems to retain its cliche quality to people looking at it. In painting, more than in some of the other arts, I think, one assumes that because it looks like a cartoon its really just the same. Whereas in music, I think, if you alter a popular tune just slightly, the alteration would be immediately perceptible and it would look artistic. In painting you can alter the image of an eye or nose, a shadow or something from a complete cliche, without its ever being understood that anything is happening artisticaliy. DS: In what direction do you try to alter the cliche? R L: Actually, in a number of ways. Sometimes I try to make it appear to be more of a cliche, to kind of emphasise the cliche aspect of it, but at the same time to get a sense of its size, position, brightness and so forth as an aesthetic element of the painting. And they can both be done at once, as you can certainly do a portrait of someone and also make it art. 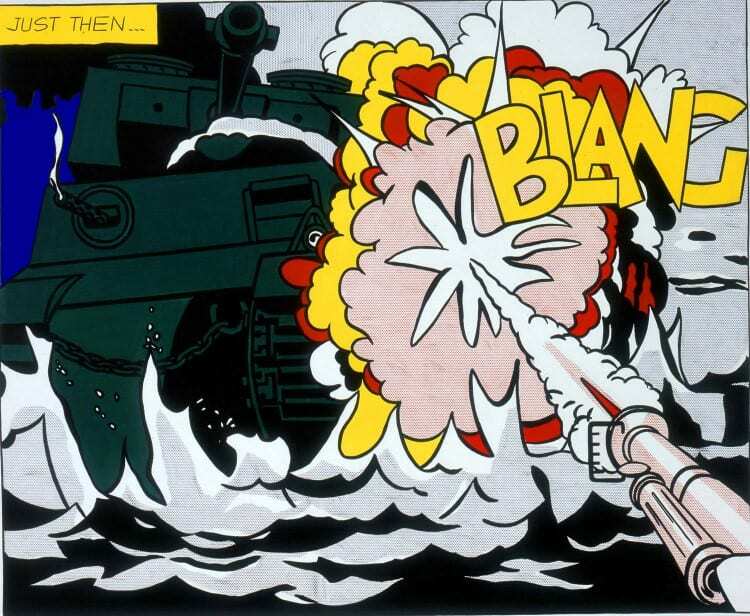 DS: What is the kind of thing that you might do in using cliches from cartoons in making a painting? I mean: what would be lacking in the cliche that you would want to give it? R L: There’s a sense of order that is lacking. There is a kind of order in the cartoons, there’s a sort of composition, but it’s a kind of a learned composition. It’s a composition more to make it clear, to make it read and communicate, rather than a composition for the sake of unifying the elements. In other words, the normal aesthetic sensibility is usually lacking, and I think many people would think it was also lacking in my work. But this is a quality, of course, that I want to get into it. DS: But often the adjustments that you make are very small. R L: Yes, and I think that that’s it. I try in a way to make a minimum amount of adjustment. Sometimes you get a very interesting image that would almost be good by itself except that this was not the artist’s intention. I think that one needs more than pure intention to make a work of art: in other words, my intention to exhibit doesn’t automatically make it a work of art. But the original cartoonist has a job to do. He gets a story out and he’s very good at his craft and puts it together and it’s very interesting, but it isn’t really inventive and it isn’t really formed. I think it’s inventive only in a mass way, that it has become inventive if you suddenly sit back and look at it and say: “My God, look what’s happened to this image. We take this for an eye and this for a shadow under a chin and look what it really looks like.” But this has gone on from generation to generation of illustrators, each one adding a little bit to the last, and it’s become a kind of universal language. So I’m interested in what would normally be considered the worst aspects of commercial art. I think it’s the tension between what seems to be so rigid and cliched and the fact that art really can’t be this way. I think it’s maybe the same kind of thing that you find in Stella or in Noland where the image is very restricted. And I think that is what’s interesting people these days that before you start painting the painting, you know exactly what it’s going to look like – this kind of an image, which is completely different from what we’ve been schooled in, where we just let ourselves interact with the elements as they happen. This highly restrictive quality in art is what I’m interested in. And the cliche – the fact that an eye, an eyebrow, a nose, is drawn a certain way – is really the same kind of restriction that adds a tension to the painting. DS: You were saying that sometimes you actually want to emphasise the cliche. Now this, I take it, would have to do not so much with its formal properties as with its meaning and its place in people’s perceptions? R L: Yes, I think so. DS: But what is it that interests you about emphasising the cliche? You obviously enjoy the cliches of the romantic or adventure style strip cartoon. You like calling attention to these cliches. You like pointing them up. You like in a sense making them more like themselves than they really are. R L: I have a feeling that in many ways I don’t do as well as the original cartoons in this way. By the time the painting is put together, a lot of the impact of the original cartoon is really lost. DS: But is being interested in these cliches like people who care for Mozart and Beethoven also caring for Rogers and Hart and the Beatles? They wouldn’t do so in a patronising way; indeed, a piece of popular music might mean a great deal to them because of its associations. Is this your attitude to the strip cartoons, or is it not that at all? Or is it partly that and partly something else? R L: I’m not sure that what I’m going to say is really true. I don’t care whether they’re good or bad or anything else. But they are subject matter, and I’m only using them and I am re-interpreting them. If I were working from three-dimensional things – trees and so forth or gas-stations that actually existed – there would be no problem. The only thing I’m doing is that I’m not putting perspective into it, so that I seem to be doing the same thing that they’re doing. In other words, they’re making a flat image and I’m making a flat image, and mine is very much like theirs. But the real difference is the fact that there’s really no perspective in my images, which I think is an element of the work. I both like and dislike the cartoons. I enjoy them, they’re probably amusing in some way, and I get a genuine kick out of them, though usually only a few frames will be really interesting to me. They’re even strong in some ways. I think when they’re very well drawn, certain sections – it may be partly accidental or maybe it’s an innate ability on the part of the person that is doing the cartoon – really may be good. But by and large I think I look at them as being kind of hokey, just as I would look at those three-dimensional plastic photographs. That kind of material has been a silly thing for us to be spending time and technology on. DS: Insofar as they are silly, do you enjoy the absurdity of the activity of going to a great deal of trouble to blow these cartoons up and make them a little more beautiful than they are? And, by the way, admit that maybe they’re less so? Is this an absurdity that appeals to you? R L: I think so. But I don’t think of myself as really blowing them up and attering them. I get involved with them to the extent that I am no longer thinking in terms of the original, although I must admit, when I’m finished, there’s a striking similarity between the two. But the whole fact of using the cartoons is lost. I work on several of them for a month or so, and on the first day or two I’m really involved with the original image, and after that I’m working on the painting. DS: Partly because you begin, I believe, by making a drawing, and you paint from that drawing. R L: I make a drawing from the original cartoon, or rearranged from a group of cartoons. Or they might be made up: they range from being completely made up by me to being very close to the original. And then that drawing is projected on canvas. This is a rather recent development; I used to do them just fresh and from the cartoon itself. Everybody thought that I was projecting them up, so I did. But then I work on that drawing in pencil on the canvas for quite a while, and then I work on the painting, finishing it for quite a while too. DS: But once you’ve done the drawing, do you ever refer back to the original cartoon? DS: By using a subject which is absurd, are you saying: “I am using subject matter; I am not painting abstract pictures. All the same, the subject matter is absurd, so it doesn’t really matter.”? R L: No, I think I’m really interested in what kind of an image they have and what it really looks like as well as the formal aspect of it. Let it go at that. I’ll just do it anyway. I’m interested in the kind of image in the same way that one would develop a classical form, an ideal head for instance. Some people don’t really believe in this any more, but that was the idea, in a way, of classical work: ideal figures of people and godlike people. Well, the same thing has been developed in cartoons. It’s not called classical, it’s called a cliche. Well I’m interested in my work’s redeveloping these classical ways, except that it’s not classical, it’s like a cartoon. I’m interested because of the impact it has when you look at it, not because it does anything formally. As a matter of fact, it’s really contradictory to form, it’s a restriction on form. I mean, you have to take into account something else while you’re forming this painting. The hair, the eyes, whatever it is, have to be symbols which – it’s sort of funny to say this – are eternal in this way. In realising of course that they’re not eternal. But they will have this power of being the way to draw something. I don’t know how to express it beyond that, but if it didn’t quite look like the kind of eye I wanted it to look like and the kind of mouth I wanted it to look like, I would be changing it; it would bother me a lot. It isn’t purely a formal problem. I’m not sure exactly why I do this, but I think that it’s to establish the hardest kind of archetype that I can. There’s a sort of formidable appearance that the work has when this is achieved. I think it also doesn’t become achieved unless it’s in line formally; just by itself it doesn’t work. In other words, the enlarged cartoon itself would not do anything; it would be a kind of joke. But I think it’s when the formal and this aspect of it being the right kind of eye come about, you have something. I think, really, that Picasso is involved in this. In spite of the fact that it seems as though he could do almost any kind of variation of any kind of eye or ear or head, there are certain ones that were very powerful and strong because of the kind of symbolism that he employed. And I don’t know the meaning of this. It’s what I think I’m up to, anyway. DS: When you’re doing, for example, the girl Iying on the pillow with the balloon caption saying: “Good morning.. . darling”, this girl is a certain modern ideal in exactly the same way as the classical head of Venus is also an ideal kind of beauty. The readers of those magazines would like to look like that; they believe in it as an image. Now, do you believe in it as an image, as well as not believe in it? R L: No, I don’t really believe in it. DS: I mean, do you like girls who look like the girls you paint? R L: The kind I paint are really made of black lines and red dots; I see it that abstractly. It’s very hard for me to fall for one of these creatures, because they’re not really reality to me. However, that doesn’t mean that I don’t have a cliched ideal, a fantasy ideal, of a woman that I would be interested in. But I think I have in mind what they should look like for other people. DS: What would you expect would be the reaction to seeing one of your cartoon paintings of somebody who was in the habit of reading these cartoons with complete seriousness, if there is anybody who does? R L: I have had actual experience in this way. When I was doing the paintings for the World Fair, I was doing them out of doors in front of my garage in Jersey, and people would pass by and make comments, and you got all kinds of comments on various levels. You would get children who would realise that this was rather funny for art, which was rather sophisticated. And you would get older people who thought I was doing a very good job of it, just like the cartoonist: it was wonderful art for this reason. DS: But as to your attitude towards these cliche goddesses, you say that it’s not a particularly affectionate attitude? R L: Well I don’t know. I think it is and it isn’t. DS: I mean obviously it’s ironical, but how ironical? sense. It has to be right to make it all work as a visual thing. On the other hand, there’s very little sense in a painting of a girl looking at a photograph of her gentlemen friend and saying “Good morning… darling.” At the same time, it sums up a lot of things. Everybody believes in it on one level and everybody talks like this, in spite of the fact that it looks funny when you read it. DS: I’m interested that you’ve already read a story into this picture by talking about her looking like this at her gentleman friend, not at her husband. R L: I wish you hadn’t brought that up. DS: This does suggest that you are interested in the literary qualities of these images. R L: I don’t think I know why, but I am. DS: You don’t think you know why. R L: No. I think I can make up reasons, as I’ve been making them up, but I’m not really sure they have anything to do with it. It’s just that it has a certain kind of impact on me when all of this is right, even when the statement is a cliche. There are different kinds of statements that I put into these paintings. Some of them are very cliched, something that could be said thousands of times and has been. But I’ve done one of a scientist which is just a very long sentence which has so many subordinate clauses in it that you have no idea what the man was saying to begin with, so that’s in a way humorous for another reason. And it also takes up a block of space in the painting, which interests me too. This becomes kind of Pop poetry in a way. But usually the statement is succinct and cliched and it’s exactly like the drawing in that way. And I just like it when it falls in place that way. I don’t really know why. And as you’ve seen, it’s very different from the kind of work I was doing earlier. That was the opposite of the cliche, so it’s been a kind of learning process to me. I think the idea isn’t so much to mystify other people as to make an interesting problem for me to do. Maybe it’s interesting because it’s so different from what I’ve been schooled in. DS: It’s an extension of something that’s always been done a great deal in art, which is using subject matter that has hitherto been regarded as being taboo, or beneath the artist’s dignity, and showing that he can make art out of this. R L: That’s what realism is. adaptations of fine art images, your Picassos and your Mondrians? R L: I kind of wish you’d explain them to me, because it really doesn’t do the same thing. It takes something which is already art and apparently degrades it. It’s like a five-and-dime-store Picasso or Mondrian. But at the same time it isn’t supposed to be non-art. It’s a way of saying that Picasso is really a cartoonist and Mondrian is too, maybe. I don’t really know. I don’t think I understand it, but I think that it’s a way of making cliches that occur in Picasso more cliched – a way of re-establishing them but also making them not a cliche. I think that it does just that. DS: Yes, and that of course brings us to the most recent work, the abstract expressionist brush-strokes. R L: Yes, this is in line, pretty much, with the attitudes to Picasso and Mondrian. DS: Because those brush-strokes are cliches, aren’t they? They’ve become cliches of contemporary art. I suppose that Rauschenberg was the first person to comment on this when he made a very slashing dribbly abstract expressionist painting and then made a duplicate of it. That, I take it, was the first move in this direction. DS: And you’re really continuing this by doing these big slashing brushstrokes but doing them in a way in which they’ve been very meticulously and carefully formed and shaped. R L: And of course I’m not sure that Kline didn’t do this too in his own way. They look like a brush-stroke but they’re not one brush-stroke. I hear there were drawings for them. They are certainly reworked when you look at them, not spontaneous brush-strokes. i think this is true of all of them really, that they were symbolising brush-strokes, they were symbolising that art is art, but at the same time they were drawing a picture of a brush-stroke. It has at first a degrading aspect, the fact that it takes something which had a certain sensibility before and leaves that out, and puts it in again, in the same way that I would take Picassos which, when you really look at them, have very odd shapes, that are something like a triangle – only, I’ll really make a triangle out of them to make it more of a cliche. But, at the same time, it is somewhat bent towards forming a work of art, so that it has this little twist to it also, so that it’s re-establishing it as art but with more of a cliched manner. I think I’m doing the same thing with the brush-strokes, simplifying them and epitomising them but still trying to make an organisation out of them. DS: You’ve actually made them, it seems to me, look more violent. In building them up in this meticulous way, you’ve made them more violent and aggressive and slashing than they ever are when they’re made in a slashing way. R L: Well I hope so. DS: The thing that impresses me about the biggest and perhaps the best of these recent paintings…. R L: In America the biggest is the best. DS: … is that I see humour in it but I also see it as a very dramatic painting. And this, I take it, was also part of your intention. R L: Yes, I think that’s always part of my intention. DS: In other words, it’s another case of degrading the thing and then building it up again, is it? The abstract expressionist brush mark is meant to be a dramatic mark. You make a joke about it, but you make it dramatic again. In the same way as you do with the Picassos: you degrade Picasso but aiso try to take it back to art. R L: And I think that there’s maybe the same element in the Picasso and the brush-stroke that’s in almost all subject matter that’s violent, sentimental, romantic, highly emotionally charged. But the method of doing it is the very removed method of commercial art. And it’s really not so much that I use that method, but that it appears as though I’ve used it and as though the thing has been done by a committee of people rather than an artist at work. DS: In the abstract expressionist brush-stroke paintings and especially in the biggest one, each dark and light in the stroke of the brush is brought out by being carefully drawn, meticulously done. And one of the reasons why the result seems peculiarlyviolent and aggressive is because of the imagery of things like teeth and other jagged, tearing things that are seen in your carefully done image of the violent brush-stroke and are much more vivid there than they are in the original violent brushstroke. Were you conscious of making this sort of imagery of teeth and knives and other violent instruments? R L: No. I did notice that some of the edges of the brush-strokes looked like explosions and things, but I really wasn’t thinking of any other imagery except the obvious. DS: But you did want it to be violent and dramatic, through making the darks blacker and the lights more vivid and so on. R L: Yes. And its size. These would be very large brush strokes for anybody’s painting. They’re blown up and magnified even by comparison with brush-stroke paintings that were very large when they were done. I wasn’t able to make anything that would look like a brush-stroke, they all looked like something else, and it took me a while to develop the symbolism which would remind people enough of brush-strokes and would be the kind of shape I could use in painting. I mean a brush-stroke really doesn’t look anything like these things: you’d have black lines around solid colours, and it just isn’t anything like a brush-stroke any more than a cartoon head is like a head. Or a photograph of a head. It was a question of developing some kind of ciiche or some kind of archetypal brush-stroke appearance which would be convincing as a brush-stroke, and which would be in line with elements I like to use and am familiar with using. DS: In some of your last abstract paintings before you started to do Pop Art, I’ve noticed that there are passages where you’ve got what seems to be a trail left by a very wide brush very charged with paint, with the paint put on heavily across the canvas. And it struck me that there it was as if those marks were not merely slashing brush-strokes, but almost like illustrations of slashing brush-strokes; they had a peculiarly concrete and material quality in the paint. R L: I think I was aware of that. R L: Yes, not to the same degree as later, but I think I recognised that I was making brush-strokes like brush-strokes. DS: Without any humorous intention? DS: And when you started to have the idea of doing these new brushstroke paintings, you didn’t think back at all to the last abstract expressionist things you yourself had done? R L: No. But I realised after I had done some that there was a similarity between the two. The kind of brush-stroke in some of these is very much like the kind I was doing then. This was maybe more a parody of myself than anyone. But I think that these brush-stroke paintings are really not so much a parody of anyone’s paintings as an epitome or codifying of brush-strokes. I think it’s a sort of synthetic Abstract Expressionism. It’s really in a way what Synthetic Cubism did to collage, in that it made a picture of a collage. And this was in some ways a picture of a brush-stroke. DS: Yes, and in Synthetic Cubism there was plenty of play of that sort. Was this a painting of a piece of grained wood, was it a piece of grained wood, or was it a cut out piece of paper imitating grained wood? R L: That element of play in Cubism: where the play becomes more literary, it led to Dada. I don’t think that my work relates to Dada, though probably everybody’s painting is influenced by Dada, including Jackson Pollock’s. But I think that the principal influence was Cubism and still is. 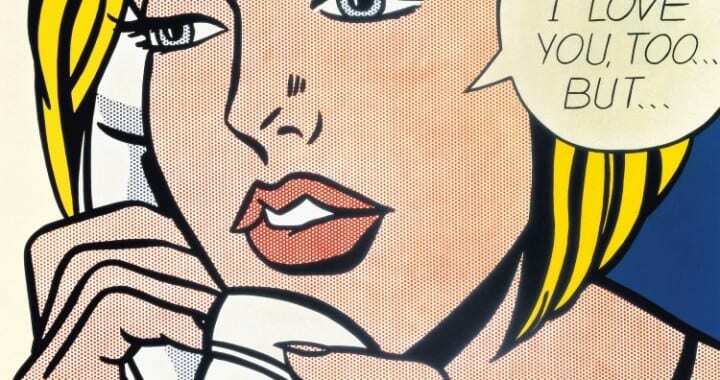 Posted in Interviews, Painting and tagged Interview, Interview R, Painting, Pop Art, Roy Lichtenstein.